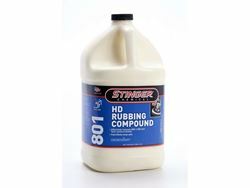 Stinger's HD Rubbing Compound is a very aggressive polishing compound that will remove up to 1200 grit scratches and will polish the surface to crystal clear finish. Formulated to work with today's new dual action polishers as the first step of a 2 step proces. Available in quarts or gallon containers. Body Shop Safe!